is stylish high end pizza place with 4 Northern California locations. We reviewed the location in upscale San Jose’s Santana Row shopping center. Pizza is the draw, so we focused on it. The pizza is thin crust artisanal Roman style. They also serve pasta and meats. Decor, Vibe - Modern room with some antique touches. They have outdoor seating, that works great for taking in the scene. Santana Row is definite a fashonista’s paradise. 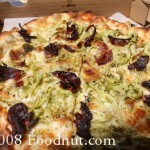 The photo above is of the Three Cheeses, Shaved Broccoli, Caramelized Onion and Pancetta ($10.50 Small) - Very thin crust. Weird combination of healthy vegetables with bacon. Little Salty. Not much pancetta. Much of the crust’s edge was burnt. So thin, we had to eat entire pizza to make it a full meal. We also had the Spicy Fennel Sausage, Portobello Mushroom and Roasted Onion ($11.25 Small) - Very thin crust. Very Greasy, Sausage wasn’t spicy at all. Crispy crust on the edge buy chewy towards middle. I’d recommend going to nearby Straits Cafe or Yankee Pier instead of this place. For better thin crust pizza, hit Pizzeria Defina or A16 in San Francisco. Reservations are not accepted, but guests are encouraged to call ahead to be placed on the wait list during busy times. I will give Pizza Antica in San Jose 3 out of 8 slices.